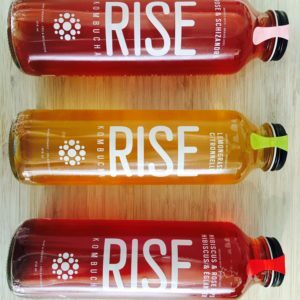 You may have heard of the health trend of Kombucha going around right now. But Kombucha is nothing new, it is actually a very traditional drink with a history tracing back 1000’s of years ago. Simply, Kombucha is a fermented, lightly effervescent sweetened black or green tea drink. Kombucha is made by adding specific healthy strains of bacteria and yeast to black or green tea and is fermented for usually a week. During this fermentation, a large amount of probiotics is produced. Probiotics improve your gut-health by proving healthy bacteria. These bacteria can improve many aspects of health, including digestion, inflammation and weight loss. Eczema is a chronic, inflammatory, relapsing, and non-contagious skin disease known to affect 20% of children. Studies have shown that probiotic supplementation have clinically improved children with Atopic Dermatitis. Kombucha shares the same health benefits of green tea since it is made with it. Studies show that regularly drinking green tea can increase metabolism, reduce fat, improve cholesterol levels, and also help with blood sugar control. Rather than taking antioxidant supplements, consuming foods and beverages high in antioxidants are better for your health. Kombucha, when made with green tea, has a very powerful antioxidant effect on the liver. Rat studies have shown a 70% reduction of toxic chemicals when consistently drinking kombucha. Cancer is facilitated by cell mutation & uncontrolled growth. Studies have shown that kombucha helped prevent the growth and spread of cancerous cells especially in prostate cancerKombucha is so effective in the fight against cancer because of the high concentration of tea polyphenols and antioxidants. Studies on diabetic rats have found that kombucha slowed down the digestion of carbohydrates. This in turn, reduces blood sugar levels. A recent study has also shown greentea drinkers have a 18% lower risk of becoming diabetic! Studies find that kombucha can greatly improve LDL and HDL cholesterol levels in only 30 days. More importantly, people that drink green tea (found in Kombucha) have up to a 31% lower risk of developing heart disease. Studies have shown that within Kombucha, EGCG protects cellular damage and protects the body from anti-inflammatory responses. The composition of Kombucha contains vitamins B1, B2, B6, B12, Vitamin C, and 14 amino acids. Kombucha also has small amounts of caffeine found naturally from the green/black tea. You can find many great tasting flavours of Kombucha at The Organic Compounding Pharmacy!